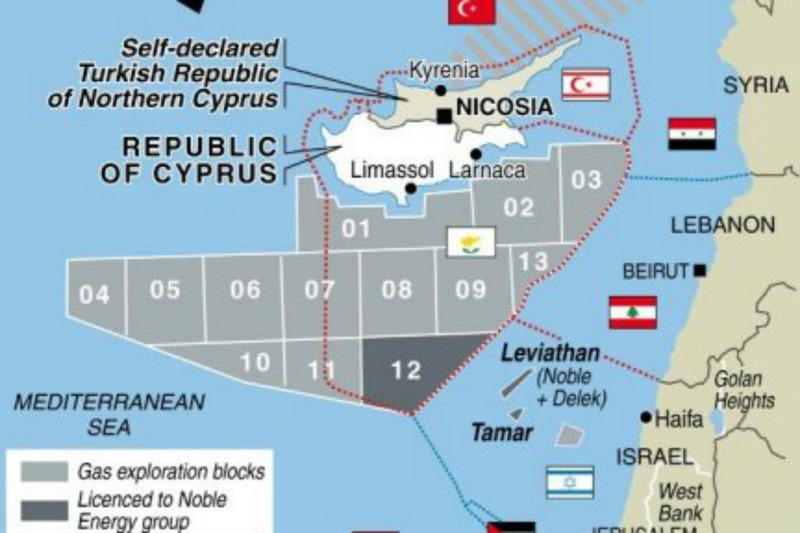 In addition to Cyprus and Turkey, Israel and Lebanon are also at odds over offshore gas exploration and marine boundaries. COSIA – Cyprus said on Sunday the Turkish military was obstructing a drill rig contracted by Italy’s Eni from approaching an area to explore for natural gas, highlighting tensions over offshore resources in the east Mediterranean. The Saipem 12000 drill ship had been heading from a location south-southwest of Cyprus towards an area southeast of the island when it was stopped by Turkish warships on Friday, Cyprus said. There was no immediate comment from Turkey. Cypriot president Nicos Anastasiades said Cyprus was taking the “necessary” steps over the matter, but seemed keen to play down any escalation. “From our side, our actions reflect the necessity of avoiding anything which could escalate (the situation), without of course overlooking the violation of international law perpetrated by Turkey,” Anastasiades told journalists in Nicosia. In Italy, a spokesperson for state-controlled Eni confirmed the drill ship was stopped on Friday by Turkish military ships. Using the Saipem 1200, Eni had previously reported a promising gas discovery south-southwest of the island in another location on Feb. 8, inside Cyprus’s exclusive economic zone. Blocking the ship is the latest twist in decades-old feuds and overlapping claims in the eastern Mediterrananean, brought into sharper focus by the discovery of some of the world’s largest gas finds in the past decade lurking in the watery deep. Cyprus is ethnically divided, and Turkey, which supports a breakaway Turkish Cypriot state in north Cyprus, says Greek Cypriots have no jurisdiction to explore for natural gas. Greek Cypriots say it is their sovereign right. Greek Cypriots run Cyprus’s internationally recognised government. It has no diplomatic relations with Turkey. The Saipem 12000 had previously been commissioned to drill the Calypso, which lies less than 100 km away from the mammoth Zohr field off Egypt. It had been heading to a maritime block, known as Block 3, where it was to start work on another prospect, dubbed Cuttlefish. Block 3, which lies far below Cyprus’s Karpasia peninsula, the pointed ‘panhandle’ of the island, lies closer to Syria or Lebanon than Turkey. In Italy, a spokesperson for Eni said the Saipem 12000 was stopped by Turkish military ships with the notice not to continue because of military activities in the destination area. “The vessel has prudently executed the orders and will remain in position pending an evolution of the situation,” the spokesperson said.